Docking Station - no longer just for norns! Updated: Possible fix for small taskbar problem. 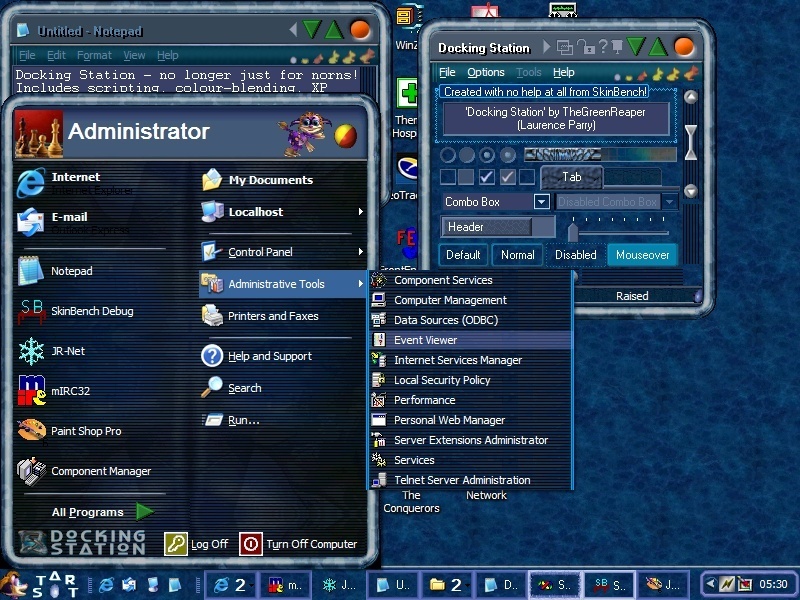 UIS1 version added, tray selection box fixed, XP user picture added, minor tweaks. Includes scripting, colour-blending, XP taskbar & panel, WebBlinds throbbers and animated buttons (start, taskbar,...) - WB 3.0+ recommended. Contains full UIS1+ (basic) and UIS1 subskins. Run iefix.reg if you have white text in IE. Non-norn version included. Comments and e-mail welcome. Enyoy! Portions copyright Creatures Labs, used with permission. Sorry to hear that, greyhaven. Can you try opening up the DockingStation.xp file in your WindowBlinds\DockingStation directory, look for the [Taskbar.TrayHorz] section (about 1/3 down) and change the ContentBottom and ContentTop values to something a little smaller, then reload the skin? It might help . . . I lost my icons in the system tray with docking stations. Any ideas HELP! OOps I clicked the wrong smile face sorry. Try my suggestion below? You may also have to delete any .wbd files lying around in the WindowBlinds/DockingStation directory. yes I change the Taskbar.trayhorz section. (If that is what you ment) It didn't change anything and that is why I emailed you. Now I have a hotpink task bar. Hmmmm By the way the sysstem recrated all of the wdb files that I deleted. Wierd Hey. Any other ideas? It's a WindowBlinds skin. To use it you need to install WindowBlinds and then click Download - it should appear in the list of skins on your Display Properties/Appearance tab (or /Skins). A creatures skin! I wonder if you're the first... heh, well great job, trying it out now. Now I only wish there were furry skins.